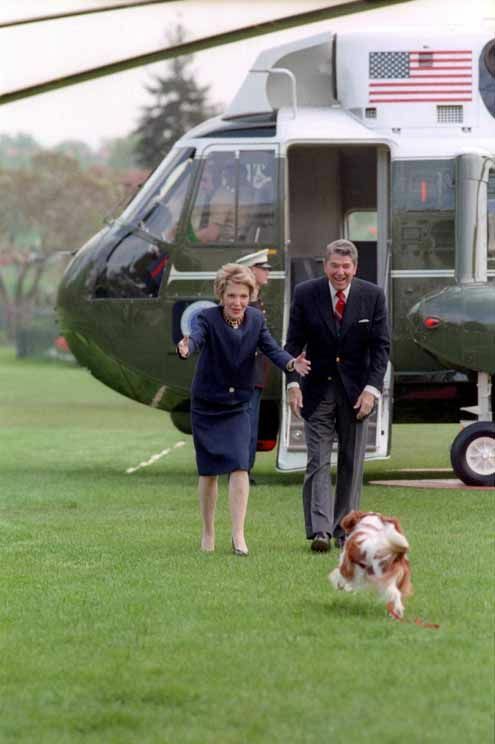 The Reagans are greeted by their dog Rex after arriving at the White House by helicopter, April 20, 1987. Photos courtesy Reagan Library. 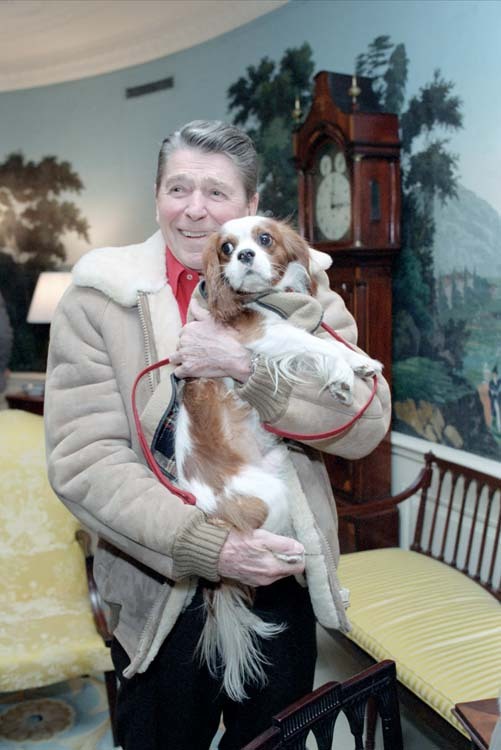 Conservative writer and commentator William F. Buckley gave a Cavalier King Charles spaniel puppy to President Ronald Reagan and his wife, Nancy, as a Christmas gift on December 6, 1985. Buckley kept Rex’s brother Fred. The Reagans, who at that time were dog-less in the White House after Lucky, their rambunctious Bouvier des Flandres, was sent to live at their California ranch, named their new puppy after Rex Scouten, the White House chief usher who retired in 1985. One of Rex’s first official duties was to throw the power switch to light the national Christmas tree in 1985. Even though Rex was smaller than Lucky, he also had a determined nature and would pull the Reagans on his leash. Sometimes it would appear the president used Rex’s pulling as a good way of dodging reporters’ questions. President Reagan holds Rex in the Diplomatic Reception Room, March 7, 1986. Rex, who was chestnut and white in color, was in the news headlines when he underwent a tonsillectomy at a Washington, D.C., veterinary hospital in 1986. Newspapers also reported on the dog’s insistent barking outside the Lincoln Bedroom and his refusal to set foot in the room, which has long been rumored to be haunted. “He just stands outside and barks at something only he can see,” reported one newspaper, The Glasgow Herald, in April 1986. 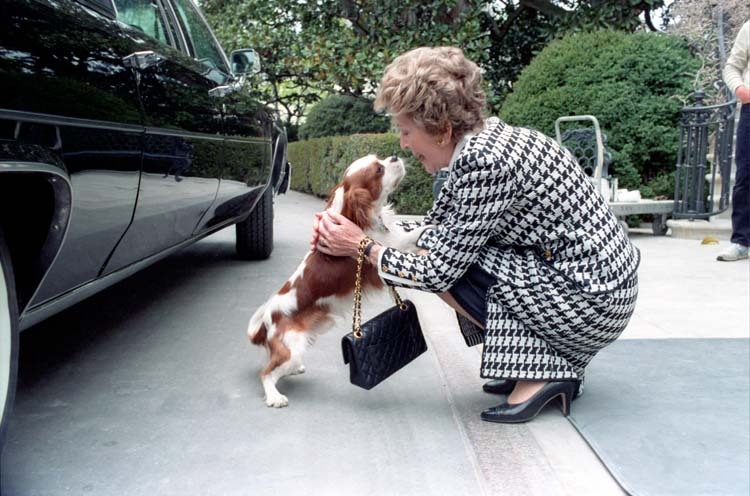 Nancy Reagan pets Rex, April 10, 1986. Rex also was the recipient of a lavish doghouse designed by Theo Hayes, the great-great-grandson of President Rutherford B. Hayes. The doghouse included framed portraits of the Reagans hanging on the walls as well as red velvet curtains. 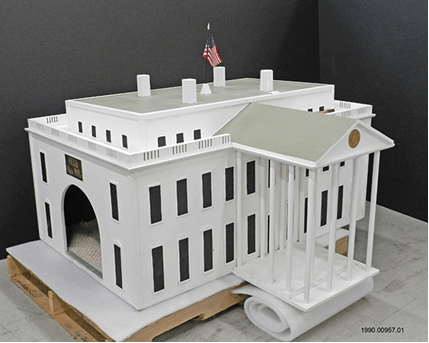 Because Rex planned to leave his fancy doghouse at the White House at the end of President Reagan’s second term, he was presented with a new doghouse that was a mini replica of the White House. Lining the inside was a piece of familiar carpet from Camp David. One-of-a-kind doghouse in the shape of the White House, January 1989. Rex traveled with the Reagans to their California home in 1989. He died at age 13 and was buried at Rancho del Cielo. Whoops! Thank you, Monica. We goofed. No worries! If you’re not a Cavalier enthusiast like I am it probably doesn’t matter, but I thought I’d let you know since this article was posted in a couple Cavalier King Charles Spaniels FB groups I’m a member of.